St Nicholas' Chapel0845 303 2760 work ChurchFrom the tip of its 19th-century spire to its Norman foundations, everything about this town centre church is dazzling. Light floods from its magnificent windows into the interior. The vividly coloured picture panels to the east depict 32 scenes from the life of Jesus. Monuments from the 17th- and 18th-centuries, some with startlingly life-like painted figures, celebrate King's Lynn's seamen, merchants, mayors and shopkeepers and illustrate the town's long history as a busy commercial centre and port. Among these monuments is a marble urn designed by famous Scottish architect, Robert Adam. The carved woodwork was of such quality that some of it is now in the V&A Museum, but in the Medieval stalls you can still see a collection of creatures that make the green man look tame. Up in the 15th-century wooden roof, carved angels with outstretched wings sing and play musical instruments. One holds a recorder –- the earliest ever portrayal of the instrument in church carving. At your feet is a fantastic collection of ledger stones including one dedicated to Robinson Cruso. The consistory court in the north-west corner of the chapel is a very rare survival. This dates from 1617 and was where the Archdeacon would judge cases relating to church law. Following a £2.7m regeneration project supported by the Heritage Lottery Fund, St Nicholas' Chapel reopened to the public on Saturday 12th September 2015. 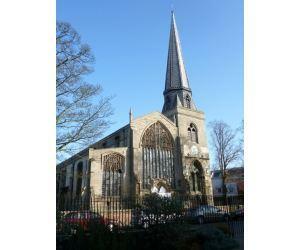 From the tip of its 19th-century spire to its Norman foundations, everything about this town centre church is dazzling. Light floods from its magnificent windows into the interior. The vividly coloured picture panels to the east depict 32 scenes from the life of Jesus.